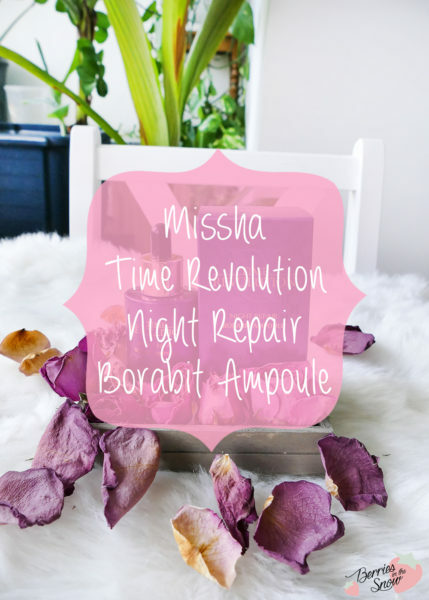 If you saw my latest empties post on Instagram you probably discovered the Missha Time Revolution Night Repair Borabit Ampoule in my picture there. Unfortunately, I used up the last drops of it and I’ve probably never been more sad about using up a serum or ampoule this time. 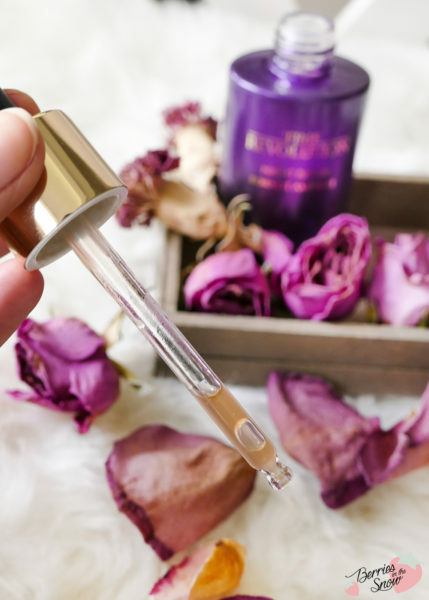 This ampoule has probably been reviewed a lot of times before and there have been comparisons to another high-end brand night serum in the past. I have no comparison to other products here, only my honest review about using this serum in the last months. 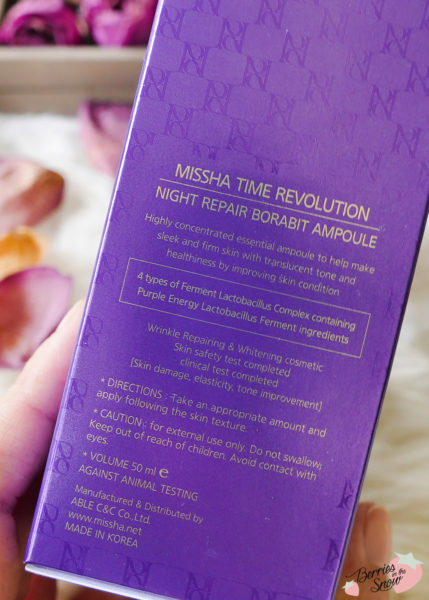 The Missha Time Revolution Night Repair Borabit Ampoule is from the famous Korean brand Missha. Missha has a lot of online stores all over the world and are available in US/Canada, Australia and even in Germany. It was the first Korean brand with a physical store in Germany, too! The products always come in a very mature and luxurious packaging and the design is usually very elegant although simple. I think that it can be liked by almost everyone. The aim of Missha is to create quality products that are affordable. 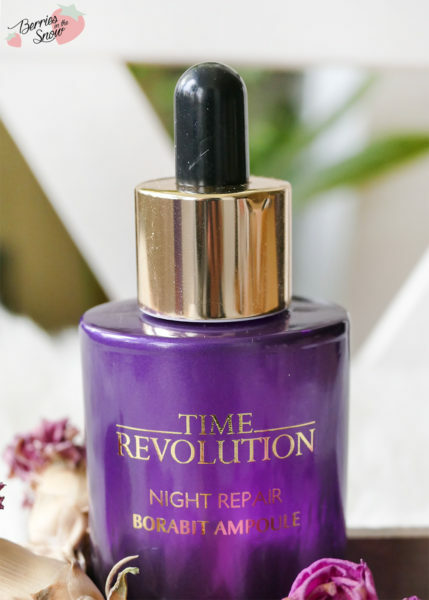 The Missha Time Revolution Night Repair Borabit Ampoule is directed towards anti-aging and brightening, using purple botanical ingredients like blueberries, aronia, beets, red cabbage, and purple carrots and combining these with lactic acid fermentation ingredients. It’s a powerful ampoule designed for nighttime use, making the skin smoother, firmer, revitalized, and stronger. 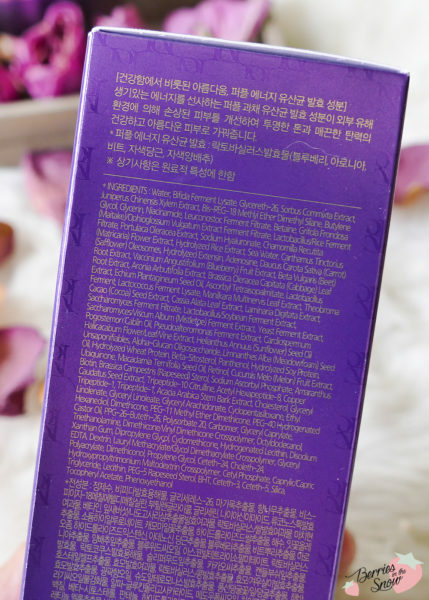 The ampoule comes in a signature purple color that refers to the purple plant ingredients used. The elegant glass bottle with an attached dropper comes packed in a cardboard box of the same color and design. The packaging looks timeless and elegant! The ingredients list of this highly concentrated ampoule might put you off at first glance, but don’t fear the long list. The ingredients are very beneficial and combine a lot of goodness! 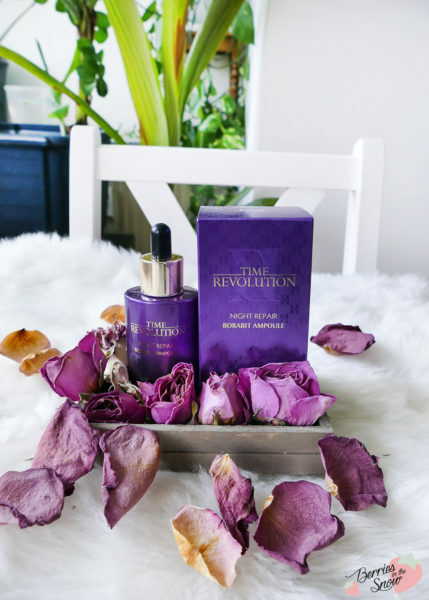 First of all, according to SkinCarisma the Missha Time Revolution Night Repair Borabit Ampoule is free from parabens, sulfates, alcohol, and EU-allergens. The ingredients are safe to use, and there is only one ingredient that could be irritating for sensitive skin types. This ingredient is Retinol! So if you have been looking for effective anti-aging ingredients you will have stumbled upon Retinol. Retinol, or Vitamin A, can cause skin reactions, including peeling, redness, scaling, itching, and burning, and also increases the risk of sunburns and sun-induced mutations. Although retinol is a great anti-aging ingredient you have to keep these points in mind and use sunscreen during the day to protect your skin from the UV rays to avoid its side effects. I guess the percentage of retinol in this ampoule is very low, but still, you should keep in mind to use sunscreen during the day while using ingredients that have these kinds of chemical peeling properties. 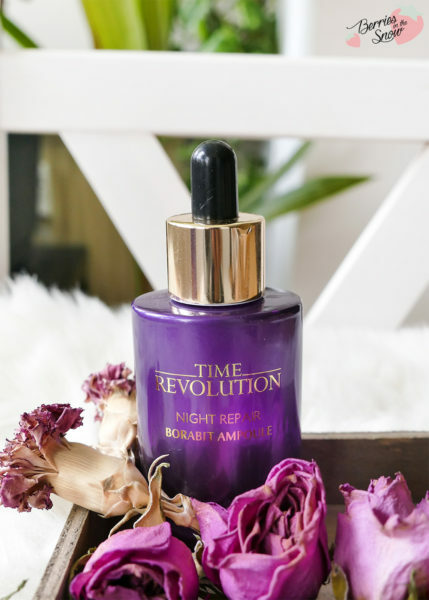 Most of the ingredients of the Missha Time Revolution Night Repair Borabit Ampoule have moisturizing properties and are perfect for hydrating the skin. Panthenol, hyaluronic acid, glycerin, or chamomile extract are some of these ingredients. The latter is also a great soothing ingredient, while panthenol and hyaluronic acid also have wound-healing properties. Other ingredients like niacinamide, vitamin C derivates, adenosine, and retinol have brightening and anti-aging properties. Additionally, there are four different kinds of ferments included, combining Lactobacillus, Bifida, Lactococcus, and Leuconostoc! I love Fermented ingredients! Ferment filtrates have anti-inflammatory and anti-bacterial activity when applied in concentrations of 5% or more. They have skin conditioning properties, are nutrient-rich, and contains many vitamins, amino acids, and proteins and helps to improve the moisture level of the skin. In order to use the product you take out the ampoule and dispense the desired amount into your palms and apply it to your skin. The best way is, of course, working upwards and outwards along your facial features. 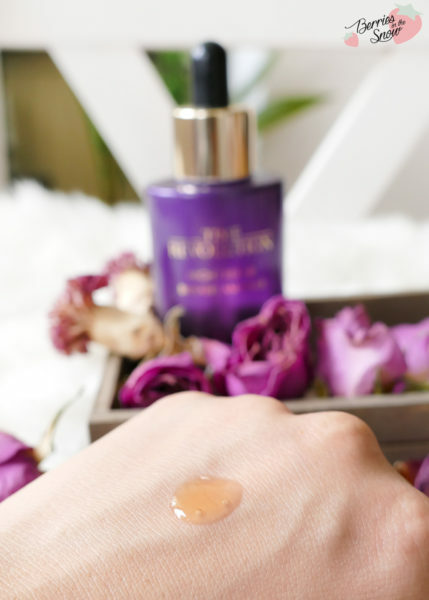 The warmth of your hand will help the ampoule to sink into your skin. I used this product as the last step before my sleeping mask or night cream. In the next morning, I’ve always used a sunscreen. The attached dropper makes it easy to dispense the product. since it is a glass dropper you can see the slightly red/orange colored ampoule. The serum absorbs fast and glides easily across the skin. It doesn’t feel heavy, despite all the ingredients included. 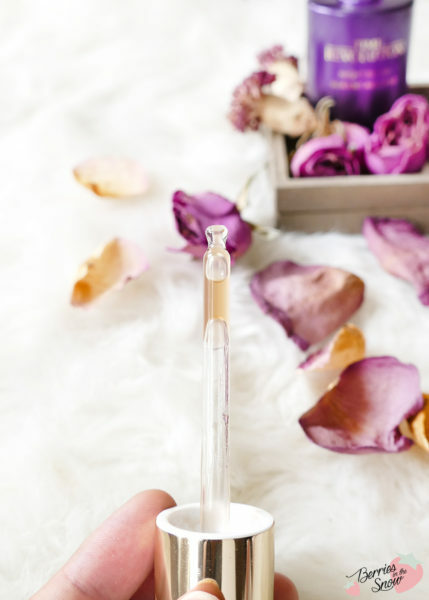 In my opinion, this ampoule really makes the skin feel smoother, hydrated, and more firm. I loved the effects in the next morning. The only downside is probably the price, sometimes 50ml are sold for around 40US$ or more. 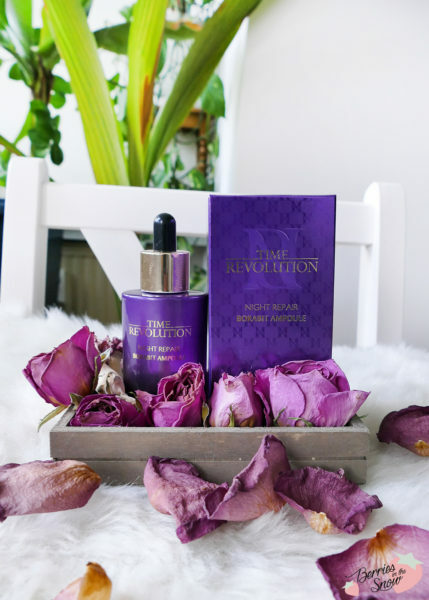 The second point is (I don’t know if that is a downside though) that Missha constantly has new formulations of their products, especially for this ampoule and the Missha Time Revolution First Essence. This can be irritating and makes it sometimes complicated to read the proper review for it. If you love to have one concentrated product that combines many beneficial ingredients in one you will love this ampoule. If you rather prefer a highly moisturizing serum, without any fuss, you can more likely switch to a serum or ampoule with a high concentration of hyaluronic acid and achieve satisfying results as well. I personally love the extra smoothness of the ferments here, and all these good anti-oxidants from the purple plants. I loved the old formulation of the Missha FTE, but they have changed it so many times now that I don’t know whether it is still like the one I loved. But this one is definitely recommendable!